To Cite: Darbeheshti F, Izadi P, Emami Razavi A N, Kamali F, Yekaninejad M S, et al. Significance of EGFR mRNA Expression in Luminal and Triple Negative Breast Tumors, Int J Cancer Manag. 2018 ; 11(2):e9763. doi: 10.5812/ijcm.9763. Background: The epidermal growth factor receptor (EGFR) has critical roles in signal transduction pathways, leading to cell growth and differentiation. EGFR expression levels vary among different breast tumor subtypes and ethnic groups. On the other hand, the relationship between EGFR expression at the mRNA level with clinicopathological characteristics in breast cancer has rarely been reported. Objectives: The present study focuses on the assessment of EGFR mRNA expression in breast tumors and the association of its expression with various clinicopathological features in Iranian patients with breast cancer. Methods: In this cross sectional study, the expression of EGFR was assessed by real time PCR technique in tumors of 52 Iranian women (27 luminal and 25 triple negative tumors) with primary breast cancer and 6 normal breast tissues. Results: The results of this study showed that EGFR mRNA was overexpressed only in triple negative tumors, and there is a high frequency of EGFR underexpression in luminal breast tumors, unlike triple negative tumors. We demonstrated that there is a significant positive correlation (r = 0.662) between EGFR expression and the size of luminal tumors. In the current study, the increased expression of EGFR is significantly associated with estrogen receptor (ER) negative, progesterone receptor (PR) negative, and grade III in breast tumors. Conclusions: These findings suggest that the majority of patients with triple negative tumors are likely eligible to receive the anti-EGFR therapies. Also, it seems that EGFR expression probably has an association with tumor size in luminal subtype of breast tumors. According to the epidemiological studies, breast cancer is the most common cancer among women around the world (1). The incidence of this disease among Iranian women is increasing (2). Breast cancer is a heterogeneous disease and is divided into at least 4 main molecular subtypes: luminal A, luminal B, triple negative, and HER2- overexpressing tumors (3). These subtypes are different in terms of gene expression patterns, prognosis, and response to treatment. The luminal subtypes are ER/PR positive and show better prognosis than others subtypes. On the other hand, triple negative tumors do not express any of the hormone receptors and HER2. These tumors have very poor prognosis with limited treatment options. So, the identification of molecular markers in different subgroups of breast cancer may help choose specific treatment strategies in each subgroup in the future. Cancer is characterized by alterations in gene expression profiles, which results in abnormal cell proliferation. EGFR (epidermal growth factor receptor) is a key player in proliferation, angiogenesis, and metastasis (4). So, it may play a fundamental role in the pathogenesis of various malignancies. The dysregulation of this gene is taken into consideration in multiple tumor types, including breast cancers (5-8). The assessment of EGFR expression in malignancies is important due to the availability of anti-EGFR drugs that were approved by FDA such as erlotinib and gefitinib. These drugs inhibit the tyrosine kinase domain of EGFR protein. Clinical trials are underway in order to investigate the effects of these drugs on patients with breast cancer (9, 10). The results of previous investigations demonstrated that EGFR expression in breast malignancies show differences among various subtypes and ethnic groups (11). According to the previous studies, EGFR expression was significantly increased in Asian patients compared with Caucasians patients (11). Thus, anti-EGFR therapies depend on detailed information about EGFR expression status in patients with breast cancer. It should be noted that the relationship between EGFR mRNA expression and clinicopathological features has rarely been reported in breast cancer. In this study, we aimed at evaluating the status of EGFR expression at the transcriptional level in luminal (as a good prognosis subtype) and triple negative (as a poor prognosis subtype) breast tumors in comparison to normal tissues in Iranian patients. Also, we investigated the association between the mRNA expression of this gene with clinicopathological characteristics of patients with breast cancer. In this study, were obtained 52 tumor specimens from patients with primary breast cancer. The studied samples included 27 luminal tumors, 25 triple negative tumors, and 6 normal breast tissues (cosmetic mamoplasty specimens). All tissues were obtained from the Iran national tumor bank (INTB) of the Cancer Institute of Iran in Imam Khomeini Hospital. Written informed consent was obtained from all patients; this study was approved by the local ethical committee at Tehran University of Medical Sciences. None of the participants were under chemo or radiotherapy before surgery. the clinicopathological features of the patients were collected from their medical records in INTB. These features included age, tumor size, ER, PR and HER2 status (based on immunohistochemistry results), axillary lymph node involvement, grade, and stage (Table 1). Hybrid-RTM kit from GeneAll company (Korea, Cat.No: 305-101) was applied to extract RNA according to the manufacturer’s instructions. The ratio of absorbance at 260 nm and 280 nm (A260/280) was used to assess RNA purity and quantity by spectrophotometer. First-strand cDNA was generated by HyperscriptTM kit from GeneAll company (Korea, Cat.No: 601-005) according to the manufacturer’s instructions. Real-time PCR assay was accomplished, using Rotor-Gene 6,000 cycler (Corbett Life Science, USA). PUM1 (Pumilio RNA binding family member 1) was used as the housekeeping gene for normalizing data. Selected primer sequences included EGFR forward 5´-AGGCACGAGTAACAAGCTCAC-3´, EGFR reverse 5´-ATGAGGACATAACCAGCCACC-3´; PUM1 forward 5´-AGTGGGGGACTAGGCGTTAG-3´, and PUM1 reverse 5´-GTTTTCATCACTGTCTGCATCC-3´. To prepare the reaction mix for real-time PCR we added 0.5 μL forward and 0.5 μL reverse primers (primer concentration: 5 pmol), 10 μL RealQ Plus 2 × Master Mix Green (AMPLIQON, Denmark, cat.No: A323499), 1 μL target cDNA, and 8 μL sterile water in a total volume of 20 μL. Reaction conditions: 95°C for 15 minutes, followed by 40 cycles of 95°C for 15 seconds and then, 59°C for 60 seconds. Samples were analyzed in duplicate and average threshold cycle (CT) values were applied. We used normal breast tissues as calibrator to obtain the relative threshold cycle (ΔCt), and the relative expression between breast tumors and normal breast tissues was calculated, using the 2-ΔΔCT method (12). SPSS 21 statistical software was used for data processing. The data were presented with mean and 95% CI for numerical data or frequency and percentage for qualitative data. Student’s t test was used to assess the mean difference in the expression of BRCA1 or EGFR between luminal and triple negative groups. The Pearson correlation statistic was used to evaluate the linear correlation between EGFR expression and tumor size. The linear regression model was applied to evaluate the linear effect of EGFR expression on tumor size. The association between the expression of EGFR with clinicopathologic factors (age, axillary lymph node metastasis, grade, stage, ER, PR and HER2 status) were analyzed by t test or one-way analysis of variance (ANOVA) tests and alternative non-parametric tests. A P value less than 0.05 was considered as statistically significant. The relative expression of EGFR gene was assessed in 52 breast cancer specimens, including 27 luminal and 25 triple negative tumors. The mean age of the studied population was 48 years old, ranging from 29 to 81. The clinicopathological characteristics of patients in luminal and triple negative subtypes are summarized in Table 1. As the expression of EGFR mRNA values for all 6 normal breast samples were between 0.32 to 2.66, values 2.8 or more were considered overexpression status and values 0.2 or less were considered underexpression status in breast tumors. We have shown the frequency of different statuses of EGFR mRNA expression in luminal and triple negative tumors in Table 2. An independent samples t test was conducted to compare the EGFR relative expression for triple negative and luminal tumors. This analysis showed that the levels of EGFR mRNA in triple negative group (Mean = 1.3, SD = 1.5) were higher than luminal group (Mean = 0.26, SD = 0.32). This difference was statistically significant (P = 0. 002) (Figure 1). Figure 1. Differences in Expression of EGFR in Luminal and Triple Negative Groups. Data Were Normalized to PUM1 (Error Bars: 95CI). 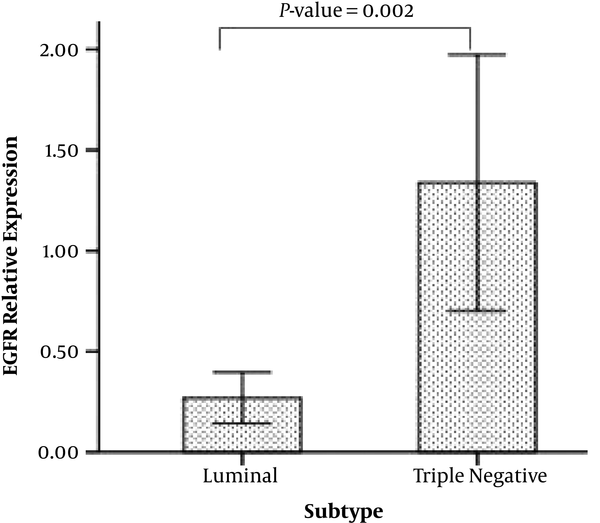 The results of the present study showed that there is a positive correlation between gene expression and size of luminal tumors (r = 0.662, P < 0.001), but this correlation was not seen in triple-negative tumors (P = 0.3) (Figure 2). The linear regression model demonstrated that for every 1 unit additional EGFR relative expression in luminal tumors, we would expect to see 3.15 unit additional size of tumor (Figure 2A). Figure 2. Association Between EGFR mRNA Expression and Tumor Size in A, Luminal Tumors (n = 27, r = 0.662, P < 0.001) and B, Triple Negative Tumors (n = 25, P = 0.3). Regression Equation by by Linear Regression Analysis. Also, independent Samples t test in 52 samples revealed that the increased expression of EGFR was significantly associated with ER negative (P = 0. 001), and PR negative (P = 0.001) tumors. Mann-Whitney test displayed that the increased expression of EGFR shows a trend in HER2 negative tumors, which did not reach to the statistically significant level (P = 0.052). Kruskal-Wallis Test determined that the increased expression of EGFR was significantly associated with grade III in breast tumors (P = 0.017). In this study, EGFR mRNA expression did not significantly associate with age at diagnosis, lymph node status, and stage of the tumors. EGFR has an important role in the control of complex cellular events such as cell growth, angiogenesis and metastasis (4). EGFR dysregulation can lead to EGFR pathway activation during several malignancies (5, 7, 8). The results of the previous studies demonstrated that EGFR expression in breast cancer has shown heterogeneity among different subtypes and ethnic groups (11). Thus, EGFR-targeting treatments will need detailed information about EGFR expression status in patients with different pathological features. The current study demonstrated that EGFR expression shows a discrepancy between different subtypes of breast tumors in Iranian patients, confirming some previous studies (13). The results of this study showed that EGFR mRNA was overexpressed only in triple negative tumors (12%) and none of the luminal tumors displayed EGFR overexpression. On the other hand, there is a high frequency of EGFR underexpression in luminal breast tumors (59.3%) compared to triple negative tumors (8%). Anti-EGFR therapies would be discriminablely indicated for patients with breast cancer with normal or overexpressed EGFR. Accordingly, the results of the current study suggest that approximately 92% of patients with triple negative tumors (80% normal expression and 12% overespression) are likely to benefit from anti-EGFR therapies on the basis of EGFR mRNA expression status. In this study, we demonstrated that EGFR mRNA expression in triple negative tumors shows a significant increase compared to luminal tumors. This result are in line with the previous studies evaluating EGFR protein (14, 15). The previous studies about the association between EGFR protein expression and clinicopathological characteristics are summarized in Table 3. Significant association between EGFR expression and large tumor size has been reported in several studies on breast cancer tumors, while studies that assessed only triple negative tumors did not observe this association. We investigated the additive effect of EGFR expression on tumor size in triple negative and luminal tumors, separately. Surprisingly, this analysis showed that increase in EGFR expression is associated with the enlargement of luminal tumors, but not in triple negative tumors. This result suggests that EGFR expression has an interaction effect on tumor size. Hence, this effect may depend on the tumor subtype. This observation could justify the inconsistency between previous studies (Table 3). Because in studies that assessed all subtypes of breast tumors probably major portion of sample size consist of luminal tumors. Accordingly, this subtype can predominantly exert influence on the final conclusion of these studies. We speculate that the increased expression of EGFR alone in triple negative tumors might not be enough for the enhancement of tumor size, and additional molecular alterations might be necessary. Abbreviations: BC, breast cancer; IHC, immunohistochemistry; LBA, ligand binding assay; TN, triple negative. In the present study, the results showed that the increased expression of EGFR mRNA is significantly associated with ER/PR/HER2 negative status and grade III in breast tumors. As shown in Table 3, the significant association between EGFR protein expression with ER-negative status and high histological grade in breast tumors have been seen in several studies. So, in this context, according to previous investigations, it seems that EGFR expression at mRNA and protein levels are generally consistent. Finding an association between EGFR expression and ER-negative tumors in several literatures demonstrates a cross-talk between the EGFR and ER signaling pathways. Although, a number of studies did not find any association between EGFR expression and hormone receptors (6, 19, 20, 24, 25). This contradiction may be due to the difference in study population. Most of these studies have examined only triple-negative breast tumors (Table 3). In conclusion, EGFR expression shows a discrepancy between different breast tumor subtypes. It seems the majority of patients with triple negative tumors may be eligible to receive anti-EGFR therapies. Clinical trials in the future should monitor the response to EGFR inhibitors in triple negative patients with overexpressed and normal expressed EGFR. This study was part of an M.S thesis supported by Tehran University of Medical Sciences (grant No: 30182). Tumor samples and their clinicopathological data were provided by the Iran national tumor bank, which is funded by the Cancer Institute of Tehran University, for cancer research. Authors’ Contribution: Study concept and design: Pantea Izadi, Farzaneh Darbeheshti; collection of samples and clinicopathological features: Pantea Izadi, Amir Nader Emami Razavi, Fatemeh Kamali; perform the experiments: Farzaneh Darbeheshti; statistical analysis and interpretation of data: Mir Saeed Yekaninejad, Farzane Darbeheshti; drafting of the manuscript: Farzaneh Darbeheshti, Pantea Izadi; critical revision of the manuscript for important intellectual content: Pantea Izadi; administrative, technical, and material support: Pantea Izadi, Javad Tavakkoly Bazzaz. Financial Disclosure: This study was supported by grant 30182 from Tehran University of Medical Sciences. 1. Ferlay J, Soerjomataram I, Dikshit R, Eser S, Mathers C, Rebelo M, et al. Cancer incidence and mortality worldwide: sources, methods and major patterns in GLOBOCAN 2012. Int J Cancer. 2015;136(5):E359-86. doi: 10.1002/ijc.29210. [PubMed: 25220842]. 2. Rafiemanesh H, Salehiniya H, Lotfi Z. Breast Cancer in Iranian Woman: Incidence by Age Group, Morphology and Trends. Asian Pac J Cancer Prev. 2016;17(3):1393-7. [PubMed: 27039778]. 3. Sorlie T, Tibshirani R, Parker J, Hastie T, Marron JS, Nobel A, et al. Repeated observation of breast tumor subtypes in independent gene expression data sets. Proc Natl Acad Sci U S A. 2003;100(14):8418-23. doi: 10.1073/pnas.0932692100. [PubMed: 12829800]. 4. Citri A, Yarden Y. EGF-ERBB signalling: towards the systems level. Nat Rev Mol Cell Biol. 2006;7(7):505-16. doi: 10.1038/nrm1962. [PubMed: 16829981]. 5. Harris AL, Nicholson S, Sainsbury JR, Farndon J, Wright C. Epidermal growth factor receptors in breast cancer: association with early relapse and death, poor response to hormones and interactions with neu. J Steroid Biochem. 1989;34(1-6):123-31. [PubMed: 2576295]. 6. Park HS, Jang MH, Kim EJ, Kim HJ, Lee HJ, Kim YJ, et al. High EGFR gene copy number predicts poor outcome in triple-negative breast cancer. Mod Pathol. 2014;27(9):1212-22. doi: 10.1038/modpathol.2013.251. [PubMed: 24406864]. 7. Brabender J, Danenberg KD, Metzger R, Schneider PM, Park J, Salonga D, et al. Epidermal growth factor receptor and HER2-neu mRNA expression in non-small cell lung cancer Is correlated with survival. Clin Cancer Res. 2001;7(7):1850-5. [PubMed: 11448895]. 8. Gui T, Shen K. The epidermal growth factor receptor as a therapeutic target in epithelial ovarian cancer. Cancer Epidemiol. 2012;36(5):490-6. doi: 10.1016/j.canep.2012.06.005. [PubMed: 22818908]. 9. Gutteridge E, Agrawal A, Nicholson R, Cheung KL, Robertson J, Gee J. The effects of gefitinib in tamoxifen-resistant and hormone-insensitive breast cancer: a phase II study. Int J Cancer. 2010;126(8):1806-16. doi: 10.1002/ijc.24884. [PubMed: 19739079]. 10. Deng M, Wang J, Chen Y, Zhang L, Liu D. Combination of SF1126 and gefitinib induces apoptosis of triple-negative breast cancer cells through the PI3K/AKT-mTOR pathway. Anticancer Drugs. 2015;26(4):422-7. doi: 10.1097/CAD.0000000000000202. [PubMed: 25588160]. 11. Zhang L, Fang C, Xu X, Li A, Cai Q, Long X. Androgen receptor, EGFR, and BRCA1 as biomarkers in triple-negative breast cancer: a meta-analysis. Biomed Res Int. 2015;2015:357485. doi: 10.1155/2015/357485. [PubMed: 25695063]. 12. Livak KJ, Schmittgen TD. Analysis of relative gene expression data using real-time quantitative PCR and the 2(-Delta Delta C(T)) Method. Methods. 2001;25(4):402-8. doi: 10.1006/meth.2001.1262. [PubMed: 11846609]. 13. Meseure D, Vacher S, Drak Alsibai K, Trassard M, Susini A, Le Ray C, et al. Profiling of EGFR mRNA and protein expression in 471 breast cancers compared with 10 normal tissues: a candidate biomarker to predict EGFR inhibitor effectiveness. Int J Cancer. 2012;131(4):1009-10. doi: 10.1002/ijc.26434. [PubMed: 21918978]. 14. Corkery B, Crown J, Clynes M, O'Donovan N. Epidermal growth factor receptor as a potential therapeutic target in triple-negative breast cancer. Ann Oncol. 2009;20(5):862-7. doi: 10.1093/annonc/mdn710. [PubMed: 19150933]. 15. Tang Y, Zhu L, Li Y, Ji J, Li J, Yuan F, et al. Overexpression of epithelial growth factor receptor (EGFR) predicts better response to neo-adjuvant chemotherapy in patients with triple-negative breast cancer. J Transl Med. 2012;10 Suppl 1. S4. doi: 10.1186/1479-5876-10-S1-S4. [PubMed: 23046633]. 16. Sainsbury JR, Malcolm AJ, Appleton DR, Farndon JR, Harris AL. Presence of epidermal growth factor receptor as an indicator of poor prognosis in patients with breast cancer. J Clin Pathol. 1985;38(11):1225-8. [PubMed: 2999195]. 17. Sainsbury JR, Farndon JR, Needham GK, Malcolm AJ, Harris AL. Epidermal-growth-factor receptor status as predictor of early recurrence of and death from breast cancer. Lancet. 1987;1(8547):1398-402. [PubMed: 2884496]. 18. Tsutsui S, Kataoka A, Ohno S, Murakami S, Kinoshita J, Hachitanda Y. Prognostic and predictive value of epidermal growth factor receptor in recurrent breast cancer. Clin Cancer Res. 2002;8(11):3454-60. [PubMed: 12429634]. 19. Buchholz TA, Tu X, Ang KK, Esteva FJ, Kuerer HM, Pusztai L, et al. Epidermal growth factor receptor expression correlates with poor survival in patients who have breast carcinoma treated with doxorubicin-based neoadjuvant chemotherapy. Cancer. 2005;104(4):676-81. doi: 10.1002/cncr.21217. [PubMed: 15981280]. 20. Viale G, Rotmensz N, Maisonneuve P, Bottiglieri L, Montagna E, Luini A, et al. Invasive ductal carcinoma of the breast with the "triple-negative" phenotype: prognostic implications of EGFR immunoreactivity. Breast Cancer Res Treat. 2009;116(2):317-28. doi: 10.1007/s10549-008-0206-z. [PubMed: 18839307]. 21. Magkou C, Nakopoulou L, Zoubouli C, Karali K, Theohari I, Bakarakos P, et al. Expression of the epidermal growth factor receptor (EGFR) and the phosphorylated EGFR in invasive breast carcinomas. Breast Cancer Res. 2008;10(3):R49. doi: 10.1186/bcr2103. [PubMed: 18522728]. 22. Nicholson RI, McClelland RA, Gee JM, Manning DL, Cannon P, Robertson JF, et al. Epidermal growth factor receptor expression in breast cancer: association with response to endocrine therapy. Breast Cancer Res Treat. 1994;29(1):117-25. [PubMed: 7912565]. 23. Nozoe T, Mori E, Iguchi T, Egashira A, Adachi E, Matsukuma A, et al. Immunohistochemical expression of epidermal growth factor receptor in breast cancer. Breast Cancer. 2011;18(1):37-41. doi: 10.1007/s12282-010-0200-2. [PubMed: 20204554]. 24. Nakajima H, Ishikawa Y, Furuya M, Sano T, Ohno Y, Horiguchi J, et al. Protein expression, gene amplification, and mutational analysis of EGFR in triple-negative breast cancer. Breast Cancer. 2014;21(1):66-74. doi: 10.1007/s12282-012-0354-1. [PubMed: 22481575]. 25. Sobande F, Dusek L, Matejkova A, Rozkos T, Laco J, Ryska A. EGFR in triple negative breast carcinoma: significance of protein expression and high gene copy number. Cesk Patol. 2015;51(2):80-6. [PubMed: 25970719].